Okay, folks. 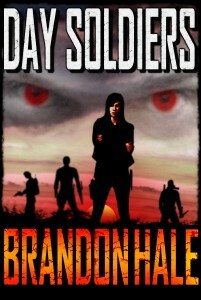 Here’s a little taste of the upcoming fourth book in the Day Soldiers series. We are not evil. We are not monsters. We are not your enemies. You have nothing to fear from us. We have jobs. We have families. We love, we laugh, we care about the world. We have absolutely no desire to hurt you. Why would we want to hurt you? We need you. We need your kindness. We need your sympathy. We need your generosity. We literally can’t live without you. For centuries, vampires stalked humanity. I’m the first to admit these creatures were monsters. We do not hide from that uncomfortable truth. We have faced the mistakes of the past and we have learned from those mistakes. We have found a better way. We have grown. We have evolved. People of New America, consider this video your invitation to Topia. We want you to meet us. We want you to get to know us. Come to any Topian city. Meet the people living in the human divisions. Stay for a day, a week, a year. The only thing you need to bring is an open mind. You’re welcome to take pictures or record videos. We don’t care. We have nothing to hide. We’ve built a good world. Topians are happy, but many of the human residents argue that Topians are the second-happiest people in Topia. No human is required to donate blood, yet almost every human does. Why? Because we’ve earned their respect and their trust. The war between the Legion and the Day Soldiers was long and bloody, but the war is over. It has been for sixteen years now. It’s time to move on. It’s time to end the prejudices. If you’d like to visit, contact your local government official. If they have any interest in developing a permanent peace, I’m sure they’ll take your request seriously and contact us. Thanks for watching this video. We look forward to earning the respect and friendship of every person in New America. So there ya’ have it. A little scene from the fourth Day Soldiers book. While I don’t have an exact release date yet, I can confidently say it will be coming soon. I’m working hard to get it to you. Thanks for the amazing support you’ve shown with this series. Every day, I find myself humbled and overwhelmed by the incredible response these books have received. p.s. Want the Day Soldiers adventures to continue? The best way you can help make sure that happens is by spreading the word. 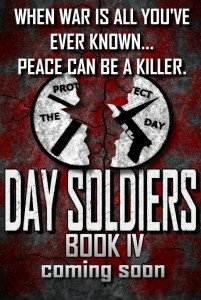 The first Day Soldiers book is currently FREE at all major online retailers. Send your friends on over to Amazon (or Barnes & Noble or iTunes) to pick it up today! Thanks again, guys. You’re the grooviest.